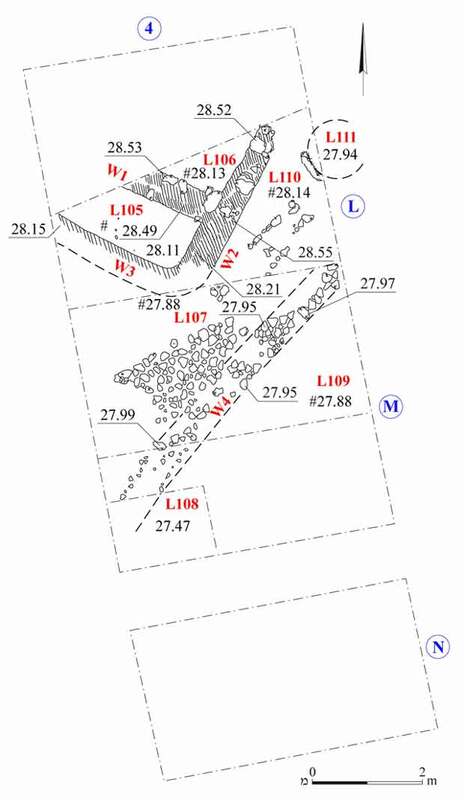 In May 2013, an excavation was conducted in Lot 51 at the Ashqelon marina (Permit No. A-6794; map ref. 15810/62075), prior to the installation of a sewer line. The excavation, undertaken on behalf of the Israel Antiquities Authority and financed by the Efgad Company, was directed by N.S. Paran, with the assistance of Y. Al-‘Amor (administration), M. Kunin (surveying), N. Zak (plans), N. Agha (archaeozoology), J. Vardi (flint analysis), M. Smilansky (lithics drawing) and I. Lidski-Reznikov (pottery drawing). The site is one of a group of sites on a coast strip (length c. 5 km, width c. 1 km) dating to the early phase of the Early Bronze Age IA. Many excavations were previously conducted in the region, exposing various parts of the site (Fig. 1; Golani 2004:9): Area 10 (License No. B-150/1997) in the northwest; Area E (Golani 2004) and Area E2 (Golani 2014a) in the west; and Area N (Golani 2014b) in the south. Other excavations were carried out elsewhere throughout Ashqelon (see Fig. 1; Golani 2004:9). The current excavation (c. 75 sq m; Fig. 2) yielded the two strata (3, 2) dated to the EB IA and an upper stratum (1) containing mixed finds. Stratum 3 (c. 20 sq m). A floor (L107; thickness 0.1 m) made of clay soil set on sterile sand was exposed. It was bounded in the southeast by a level of kurkar stones (W4), probably a foundation for a mud-brick wall. Stratum 2. Three mud-brick and kurkar walls (W1–W3; thickness 0.6 m, max. preserved height 0.25 m) were found c. 0.25 m above the floor of Stratum 3. Walls 2 and 3 formed a rounded corner of a building, and W1 partitioned the structure’s interior into two spaces. Tamped clay Floors (L105, L106) were found inside the building. Another clay floor (L110) was discerned southeast of the building. All of the floors adjoined the bases of the walls. Due to the limited exposure it was impossible to identify complete complexes; however, it seems that the building extended northward, beyond the excavation area. A scant amount of pottery sherds was found in the Strata 3 and 2. Four identified sherds were discovered in Stratum 2: a wavy flaring rim of a coarse bowl (Fig. 3:1), two thumb indented rims of hole-mouth vessels (Fig. 3:2, 3) and a flat base of a jar or hole-mouth vessel (Fig. 3:4); all four were ascribed to the EB I. 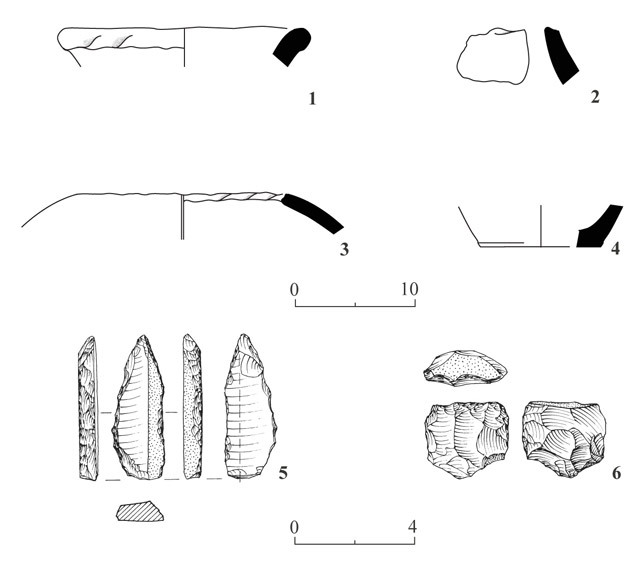 In addition, two flint implements and animal bones were found in both strata (below). Stratum 1. The sand (thickness c. 1 m) overlying the EB strata contained a few sherds from the Roman and Byzantine periods and modern refuse. Part of a pit filled with sand (L111; Fig. 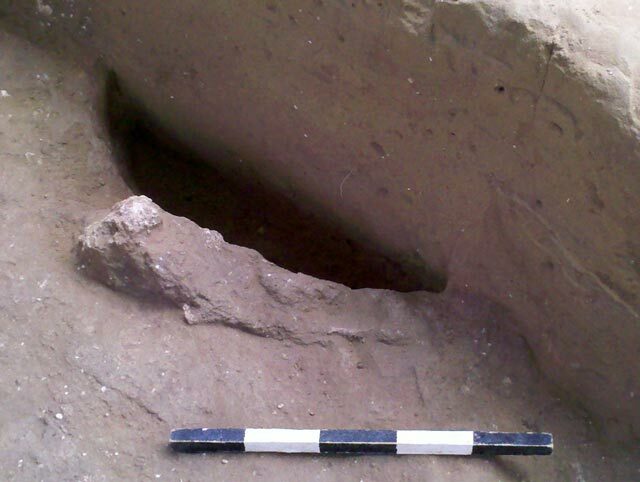 4) was found right by the excavation’s eastern balk. It penetrated into the Early Bronze strata, and may belong to activity from the Roman and Byzantine periods. The finds in this stratum were worn and lacked any archaeological context; hence they were not collected. Two flint items were found. One is a bladelet core of high quality Chalcedony flint (Fig. 3:5). This raw material bears a milky gray color and is smooth to the touch. The texture of the material indicates it was deliberately heated prior to knapping. The core has an oblate pyramidal shape and has a cortical striking platform. The second item is a drill prepared on a Canaanean sickle blade (Fig. 3:6) made of light brown raw material of medium-sized grains. Distinct signs of sickle sheen are evident on the ventral side, near one of the tool’s edges. The other side was coarsely retouched, creating an upright side. When the tool was adapted for use as a drill, an elongated point was fashioned with abrupt retouch one of its ends. These items date the site to the beginning of the EB IA, or possibly even to the end of the Chalcolithic period. The assemblage of animal remains is small and rather poorly preserved due to the deposition conditions and because the material was collected by hand rather than by sifting the sediment. The assemblage comprises remains of sheep and goats: two vertebrae (of the back and stomach), a tooth from an upper jaw and a fragment of a goat’s horn. The assemblage is too small to contribute significantly to the study of the period represented at the site. The site is clearly in keeping with the information derived from excavations previously conducted in its vicinity. However, due to the limited exposure neither the nature nor the function of the buildings that were excavated could be determined. Golani A. 2004. 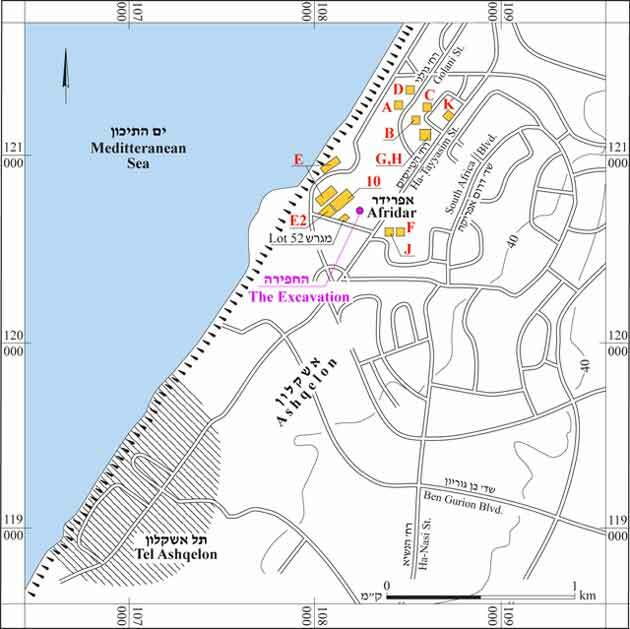 Salvage Excavations at the Early Bronze Age Site of Ashqelon, Afridar – Area E. ‘Atiqot 45:9–62. Golani A. 2014a. Ashqelon, Afridar Area E2. HA-ESI 126. Golani A. 2014b. Ashqelon, Afridar Area N. HA-ESI 126. 4. The pit in Stratum I which penetrated Strata 2 and 3, looking northeast.